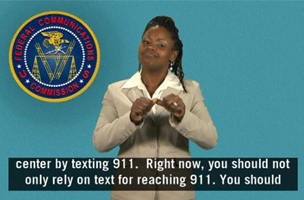 The FCC issued a statement warning users not to use its new text-to-911 feature for emergencies, unless no other options exist. Text-to-911 is a new way of reaching emergency operators and has been widely adapted by major cellular carriers since July of 2013. In January of 2014, the FCC issued an official policy announcement detailing cross-carrier implementation of text-to-911 service by December 31, 2014. The Commission has encouraged 911 call centers to begin accepting texts as text providers develop text-to-911 capability. It is up to each 911 call center to decide whether and when to begin accepting texts. Some call centers have started to accept text messages already. We expect that others will do so and that text-to-911 will become available in more areas over time. Nevertheless, even where text-to-911 is available, consumers should continue to contact 911 by making a voice call if they can, and use text only if voice is not a feasible or safe option. Since call centers are adapting the new policy voluntarily, it could take years before text-to-911 is available across the country. In the meantime, users should expect to hear bounce-back messages from their carriers when accessing the service in a location that does not support text-to-911. To find out if you live in an area with text-to-911 availability, check this deployment document issued on May 9,2014. For updates, check the FCC’s official text-to-911 status page.